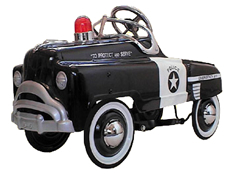 This Famous range of Police pedal cars represent fantastic value for Money! 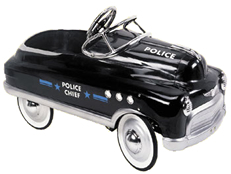 Presenting the beautiful 1950's Murray Comet Police Pedal Car. One of our best sellers, particularly because of it`s quality build, specification and most attractive price. Features include: chrome hood, chrome windshield, chrome grill ornaments, chrome headlights, chrome steering wheel, chrome portholes and hubcaps. The chrome finish is metal as opposed to plastic. Flame Decals. Sealed bearing pedal mechanism with 5 position pedal adjustments to suit most children 2 to 5/6 yrs of age. Also comes with black padded seat. All metal construction with solid Duralast rubber tyres. Delivered fully assembled to your door. Dimensions: 17" wide, 39" long and 21" tall.. Chromed windshield, hub caps, steering wheel, Hood ornament & Flashing Red Light.Overall Dimensions: Length: 36", width 15.50". Materials: Heavy gauge steel in body and undergear, solid rubber tyres. Finish. Body and undergear are finished in lead free, child safe powder coating. Wheels: Ball bearing, steel, 8" with 5/8" rubber tyres. Recommended ages: 2 to 5/6 years old. The Police car comes fully assembled, just take it out the box, and start peddaling! !